Last night we went to a lecture by Lucy Lippard at Sydney Uni. It was a rare treat to see this legend, who beautifully chronicled “dematerialization” practices in the late 1960s and 70s, and who has done some terrific work more recently on art and place and the local. In her illustrated lecture, Three Escape Attempts, Lucy Lippard will discuss her curatorial practice with a focus on Three Escape Attempts – three moments in which artists tried to escape or at least bypass the art world: Conceptualism, Feminism, and what she calls the “collaborative” moment in the early 1980s. Six Years: The Dematerialization of the Art Object (1973); From the Center: Feminist Essays on Women’s Art (1976); Get the Message: A Decade of Art for Social Change (1984); A Different War: Vietnam in Art (1990), The Pink Glass Swan: Selected Essays on Feminist Art (1995); and On the Beaten Track: Tourism, Art and Place (1999). She lives in Galisteo, New Mexico, and in 2010 will publish a book on the history of the area she lives in from 1290-1790. In the 1970s she gave the Power Lecture and in the 1980s she taught at the University of Queensland. This is a free event, no booking required. All welcome. I’m very interested in the idea in the title of this lecture – escape attempts. Art trying to work outside the artworld, escape from its boundaries. She made no mention of Allan Kaprow (from memory, he is hardly mentioned in her book Six Years either) although he had a long engagement with a very similar project of trying to escape art’s framing, and find a way to avoid the sapping of life’s essence by art. Her third period (the third “escape attempt”) was a collaborative period of socially engaged art / art as activism / art as community work by collectives in public spaces (early 1980s). Collaborative art as an antidote to social alienation. Most examples in the lecture came from things she had been involved in herself – she has always been a very engaged art writer… not “disinterested” at all. Her general prescription (it seems to me) is that art should be a kind of activism for social change. Art should not be quarantined within the “artworld”. The artworld is a zone set apart and kept safe from the actual engagements of real politics. Her talk was like an illustrated artist’s lecture – big on anecdotes and examples, not much analysis of the idea of escape attempts as a concept in itself. The paradox is that the artworld can gobble up anything, and so any escape attempt ends up being recuperated within the artworld’s scope. Thus it is impossible to escape, if one is attempting to do so as an artist. Escape attempts only secure the knot more tightly to the artworld (Lippard herself used the analogy of a bungee cord). In question time, Lippard inadvertantly mentioned her own gradual “loss of interest in the mainstream artworld” several times. Now this was something! Lippard’s own “drift away” from the artworld has perhaps achieved what could never be achieved through the “escape attempts” described in the lecture. A “loss of interest”. She simply stopped paying attention to what was going on, and did other things instead. It occurs to me that losing interest in something is a good way of depriving it of value (and thus power). “Losing interest” and “paying attention” are both terms related to value and capital. (Although, the art world never lost interest in Lippard. Through her published writings, she still exerts a strong influence on generations of artists and theorists). But the deeper question is – why “escape” the artworld? Escaping? Escaping what? (Is this a Freudian thing?) Could this be connected to her notion of conceptual art as a kind of “adolescence” – a necessary rebellion in order to forge one’s own identity before reintegrating into society? I don’t know. Resistance is futile – the artworld is an entity whose value always increases as a result of subaltern practices carried out in opposition to it. What about ideas of tradition and community? Like it or not, the artworld is our community (at least, one amongst the many different overlapping communities we belong to, and create, and constitute). We are our communities – we are the artworld. How could we (and why would we want to) escape from ourselves? 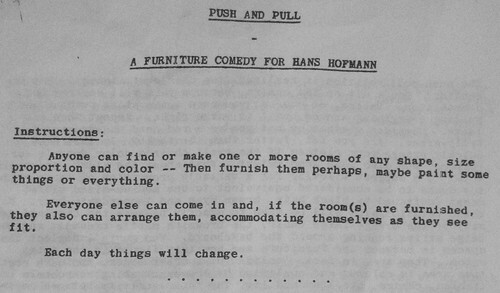 This entry was posted in odds and ends and tagged allan kaprow, artworld, Lucy Lippard on April 22, 2009 by Lucas. Liz Pulie, erstwhile publisher of Lives of the Artists Magazine mentioned to me recently that she was interested in giving up. How can I explain? It’s been a while since she put out an edition of her mag. Has she given up production? Not really…it’s just that…like my Bilateral Blog, enthusiasm and energy to write comes in irregular bursts, and it can seem like things are getting stagnant, or that the whole project is set to collapse during the quiet times. This entry was posted in odds and ends and tagged , aesthetic withdrawal, aesthetics, allan kaprow, giving up, lee lozano, lives of the artists, liz pulie, marcel duchamp, n.e.thing co., robert morris, sam hsieh on October 16, 2007 by Lucas. …artists themselves, […] today are so trained to accept anything as annexable to art that they have a ready-made “art-frame” in their heads that can be set down anywhere, at any time. They do not require the traditional signs, rooms, arrangements, and rites of performance because performance is an attitude about involvement on some plane in something going on. It does not have to be onstage, and it really does not have to be announced. music in concert halls, etc. a sonnet as a want ad, etc. Performance in the nontheatrical sense that I am discussing hovers very close to this fifth possibility, yet the intellectual discipline it implies and the indifference to validation by the art world it requires suggest that the person enganged in it would view art less as a profession than as a metaphor. At present such performance is generally nonart activity conducted in nonart contexts but offered as quasi-art to art-minded people. That is, to those not interested in whether it is or isn’t art, who may, however, be interested for other reasons, it need not be justified as an artwork. This entry was posted in performance art, theory and tagged allan kaprow, non-art, performance art, theatricality on January 13, 2006 by Lucas. …from page 60 of “Allan Kaprow”, Corso Superiore Arte Visiva, Fondazione Antonio Ratti, Skira, 1998, Milano. Find a comfortable place and sit down. Choose someone from among the people you can see and observe him/her. Copy his/her position, movements, etc, exactly. Split into three groups. Each group must try to push three different types of materials towards a given point. Use only the power of your breath. Pinch him/her and then let him/her in turn pinch you. Check the increase in temperature of the part of skin pinched. One person volunteers to be completely passive. The others must push him in directions they consider to be right. Having first agreed among themselves. Try to clean it using your saliva and one or more Q-tips. One of the pair draws a line on the ground in chalk. The other partner must follow the line close behind and erase it until either the eraser or the chalk is completely worn out. Observe your partner’s mouth in a mirror and copy his/her expressions. Each time, move further away, one pace at a time. Stop when you are too far away to see each other. Wait for a partner to rest his/her brow on your knee. If you want, swap places and repeat. Moisten a finger and blow on it until it is dry. Moisten it again and wait until it has dried by itself. Cover your head with a sheet of newspaper. Breath in and hold for as long as possible. Stop when the sensation of warm damp becomes unpleasant. Split into groups. : those who wear glasses and those who don’t. Those who do not wear glasses mist up the lenses of those who do. Those who wear glasses must then give the glasses to those who don’t. A boy/girl will give you a cold kiss and a warm kiss on each cheek. All walk, starting from the same line. Hold your breath or breath in until the handkerchief falls. 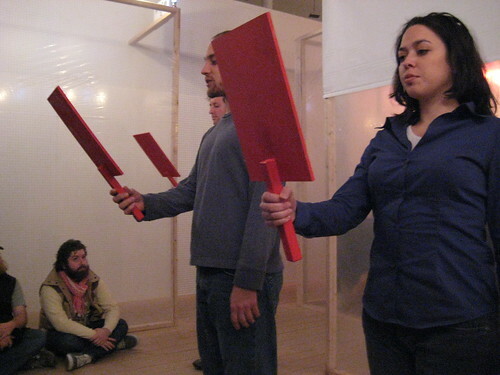 This entry was posted in education, performance art, Relational Aesthetics and tagged allan kaprow, instructions, interaction, participation, workshops on September 11, 2005 by Lucas. 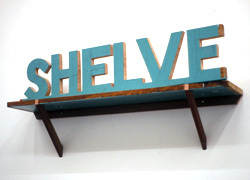 much like the legendary allan kaprow, hester is keen to shake up her students a bit, to get them out of the normal routine of university art school process – which usually involves a single student authoring a single discrete and highly tangible object/outcome (and being "assessed" individually, and by an authority rather than peers). 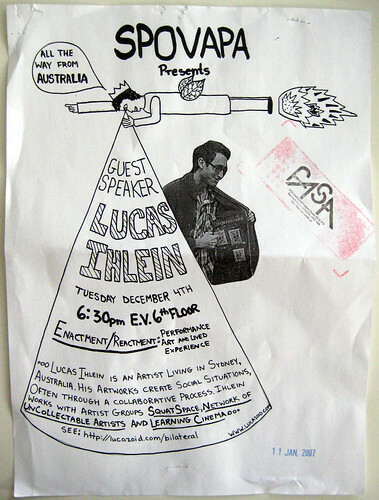 This entry was posted in education and tagged allan kaprow, Bianca Hester, workshops on April 6, 2005 by Lucas.